We are all about helping you reach your full potential. Our holistic approach using remedial massage, movement practice and client education, will empower you with the tools and techniques for optimal performance and wellbeing. We look forward to working with you and taking your performance to the next level. As Adelaide's best remedial massage specialists, we tailor every massage treatment and provide solutions to help you reach your full potential. Getting to the source of your symptoms is our priority. Experience a fully tailored and holistic approach to pain management, training recovery and performance. Welcome to b3 massage and movement, Adelaide’s best Remedial Massage Therapists. Our passion is to keep you in peak physical condition. We help our clients achieve their goals by providing tailored massage solutions and share the best movement practices suited to their needs. We listen to what you need and understand that your circumstances change each time we see you. Whether you need remedial sports massage, or advice on the best core exercises or the best yoga poses for your body, we will assist and guide you in every way we can, to get you closer to your goals. I have been visiting Jackie and Jana for several years now and have always found their service very professional and skilled. As my running has progressed from the 10km fun run to 100km ultra marathons, Jana’s massage sessions have been an integral part of my recovery program. After every massage, we noticed an improvement in our mobility, muscle balance, flexibility, recovery times, and also overall wellness. This is crucial in prolonging the state of our body & mind. We both highly recommend B3 to any athlete who is looking for an edge in body maintenance. The advice b3 are able to provide on how to manage my body between massages has also been extremely valuable. I highly recommend including b3 massage and movement in your training plan. I started going to B3 Massage and Movement a year or so ago to help with preparation and recovery for trail running events. Jackie and Jana's massage techniques really helped me achieve my best out on the track. 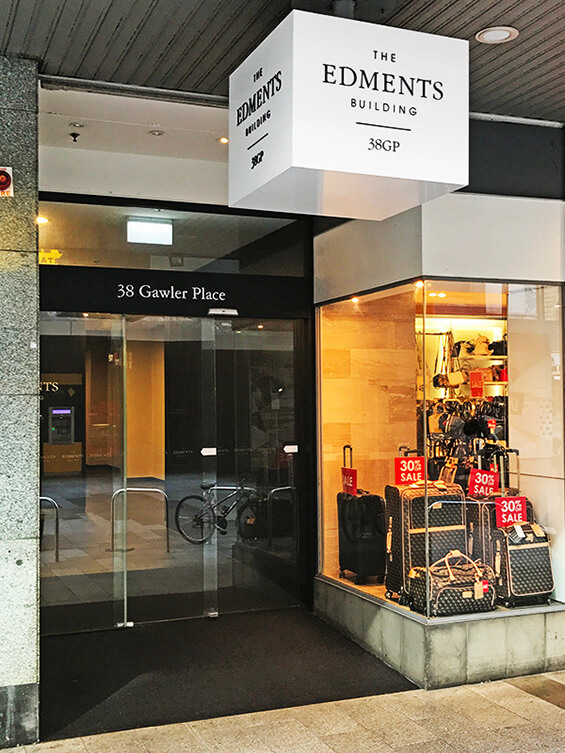 We are located in the Edments Building in Gawler Place (next to Strandbags in Rundle Mall). Take the lift to the 5th floor and walk out then left, following the corridor around. b3 massage and movement is number 509 on your right.